Following the tremendous audience response to the artwork shown in Tampa as part of Skyway: A Contemporary Collaboration, the Museum invited visitors to vote for their favorite TMA Skyway artist to be included in Skyway Selections: Audience Choice. More than 1200 ballots were cast this summer for the 22 Skyway artists with work on view in Tampa, and the results have now been tallied. Painters Elisabeth Condon and Bruce Marsh were the top vote-getters, and will share an exhibition in the Saunders Foundation Gallery beginning in December. Thank you to all who voted, and congratulations to Elisabeth and Bruce! Lives and works in New York, NY and Tampa. Elisabeth Condon’s vibrant paintings incorporate her many influences, ranging from decorative materials to art historical references. She finds inspiration in vintage fabric samples and wallpaper patterns, as well as classical Chinese scroll painting. Condon’s work is both abstract and pictorial, with textural surfaces that reflect her unique painting process. 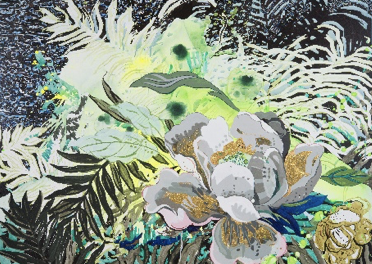 She starts each work by pouring acrylic paint across the canvas and builds the composition with imagery of tropical flora and gestural brushwork. Many paintings receive a light layer of colored glitter that renders a sense of luminosity within the canvas. Born in Los Angeles, Condon received her BFA from Otis Art Institute, Los Angeles and holds an MFA from the School of the Art Institute, Chicago. Her work has been nationally recognized, and she has won numerous awards, including the 2015 Pulse Art Fair’s Pulse Prize. From 2003-2015, Condon was Associate Professor of Painting and Drawing at the University of South Florida. Her work resides in the permanent collections of the Tampa Museum of Art and the Museum of Fine Arts, St. Petersburg. Lives and works in Ruskin. Known for his naturalistic style and abiding interest in the Florida landscape – both natural and built – Bruce Marsh has maintained for many years a fascination with the sky, and with the light and shadow that animate our surroundings. Like so many generations of artists working before and alongside him – Impressionists, Expressionists, Hyperrealists, and more – Marsh has spent his entire career exploring the potential of color, mark, and form. After many years focusing on nature, particularly the riverine landscape just outside his studio, Marsh has more recently returned to the human figure, both as a singular subject and as part of larger compositions, such as Tiki Bar and Figure Study, the large paintings selected for Skyway. Now Professor Emeritus at the University of South Florida in Tampa, where he taught for 34 years, Marsh continues to paint each day. His work is in numerous private and public collections, in the Tampa Bay area and beyond. Elisabeth Condon, 2016. Acrylic and glitter on linen, 54 x 72 in. Courtesy of the artist and Emerson Dorsch Gallery, Miami, FL. Bruce Marsh, 2017. Oil on linen, 36 x 72 in. Courtesy of the artist.